The extra £40 would easily cover a HDD. There are two main points of discussion here – the CPU choice and GPU choice. I’ve got this hooked up to my telly, which is 1080p. So that’s the resolution I’m working with, and my goal is to have nicer graphics than my 360, I want to be able to max everything out in settings for the most part. So I looked at the excellent Anandtech guide for where I needed to be to get high detail at 1080p. They recommend an AMD R270X, which is in general a little cheaper, but I managed to get a GTX 760 for about the same. 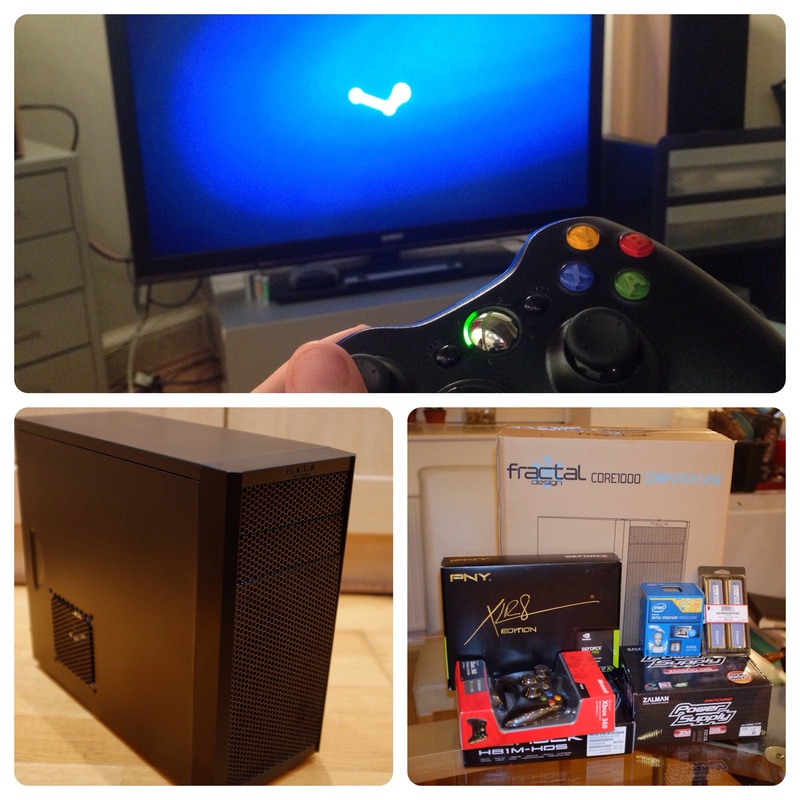 I went for it as it’s got vastly better linux support, important if I want to try SteamOS. It’s just a reference design cooler though, so it’s not that quiet – but it’s fine for my intended use – my 360 is hardly quiet! I went with a Pentium G3420 – that’s a dual core Haswell part at 3.2Ghz. This is a bit of an odd choice – at the budget end AMD have better offerings, I could have got 4 cores but with a similar/slightly lower single thread performance. There’s some argument for this, it would more closely match the many-threaded Xbone/PS4 (this machine has vastly more GPU, less threaded CPU performance). However I decided this dual core would probably be fine, and down the road I have a very economical upgrade path to a quad core i5 for about £100 if I want more performance (especially compared to AMD in general). Fractal case as it looks inoffensive, reviews well enough and has the power button in a useful place for where I keep it. I tried to get a quality name PSU with the right connectors for the GPU. 8Gb RAM is a bit overkill for current games I’m playing, but I wanted to future-proof things a little. I chose the model of RAM from the motherboards compatibility list, no real price penalty to do so. The spare 2.5″ HDD I’m using is a bottleneck, but TBH once you’re in a game, it’s fine. 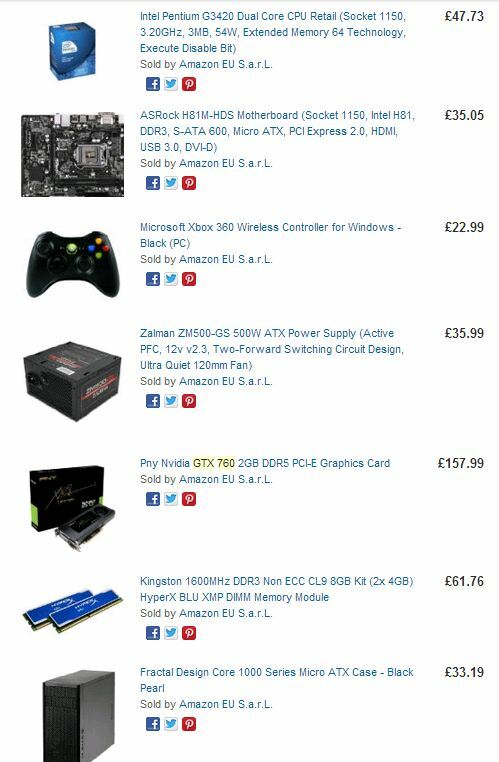 No wifi on my build, as I didn’t need it – spend about £5 more on the motherboard and you could get one with it however. Currently – Windows 7 with Steam in big-picture mode. Looks glorious, a great gamepad dashboard experience and plays damn near anything. Cheating slightly here with the budget, but I had a spare windows license. I plan to try SteamOS at some point, I expect things to be a bit slicker, but I’m waiting for proper dual boot support or ideally getting a spare drive from somewhere. This was all pretty straightforward, it’s quite easy to build a PC. Though I’m really the wrong person to ask about this, I’m not sure I can judge objectively – it’s not my first time to this particular rodeo. To install Windows, I created an install USB from my DVD, so I could slipstream on as many updates/service packs as possible. I recommend this, as even doing so Windows still wants to install a lot of updates! A quieter GPU. The Asus Direct CU II GTX760 is supposed to be a fair bit quieter (from a personal recommendation). An aftermarket CPU cooler – there are plenty about, I’d look for something focussed on quiet, thermally this isn’t a hot chip to cool. Quad core i5 – about £135 would get something basically as quick and two cores more. A cheap, smallish SSD for the boot drive. About £60 should do. Mostly cos unlike my main machine, this gets turned off. Booting faster would be nice. It takes about 2-3min to get to playing a game, seems like ages but not actually that bad compared to my 360 – it gets to the dashboard quicker, but loads games slower. And on the Steambone I never have to get up to swap disks like an animal. Cheaper GPU. Check that Anandtech Guide out (or a newer one). But a GTX 750 Ti would save about £40 and also mean a cheaper PSU as it doesn’t need the power connector, less power means quieter too. Probably save £60 or so total. 4Gb RAM – save you about £40, and for a lot of games it’d be perfectly fine, especially with a slower GPU – and suddenly you’ve saved £100. AMD APU – you can’t save a whole lot on the CPU, it’s a cheap Intel part already, but what you can do is spend a little more. Maybe another £40 gets you an AMD part with decent integrated graphics – you then can ditch the GPU entirely, smaller PSU too…probably get a build in about £250 all in. A lot less powerful, but maybe that’s fine for you? Budget case – you could probably save £15 with some nasty tin shack for the bits to live in. Check out part two of this article about how I’ve found it.